Global alliance of overseas Filipinos Migrante International will hold a small gathering at the Plaza Miranda later this afternoon to welcome the arrival of Pope Francis and to call on the Holy Father to heed the cry of Filipino migrants and their families, especially those in distress. Around Metro Manila, simultaneous activities were also held earlier today to gather “letters to the Pope” from families of overseas Filipino workers (OFWs) in distress. “As he visits the Philippines, we call on Pope Francis to speak on behalf of an estimated 15 million overseas Filipinos in over 239 countries around the world. We call on him to speak out for Filipino migrants in distress and their families,” Martinez said. There are currently 125 Filipinos on death row abroad – the most number of whom have been executed under the present Aquino administration. At least 7,000 Filipinos are languishing in jails abroad without legal assistance and at least 25,000 are stranded and awaiting repatriation in the Middle East alone. Millions are undocumented and in danger of being criminalized abroad as host countries continue to impose more strict immigration and border policies. At least half a million Filipinos, mostly women and children, are victims of trafficking. Millions more suffer labor abuses and violations and endure modern-day slavery for the sake of their families back home. Pope Francis is a staunch supporter and advocate of the rights and welfare of migrants and refugees. He has been very vocal in his criticisms on forced migration and the criminalization of undocumented migrants and refugees, and his stance against trafficking in persons and modern-day slavery. On January 16, the Holy Father will be holding a dialogue with some Filipino migrants and their families at the Mall of Asia Arena. 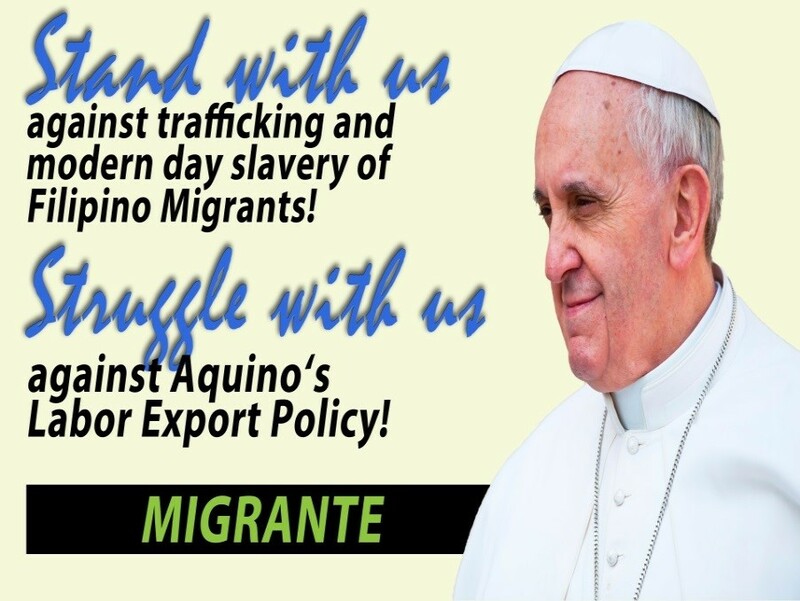 On the same date, Migrante International will be holding an International Day of Prayer and Solidarity to bring to the Pope’s attention the plight of Filipino migrants and their families all over the world. This entry was posted in News and tagged DearPopeFrancis, migrante, migrants, modern-day slavery, OFW, PapalVisitPH, Pope Francis, trafficking. Bookmark the permalink.